Ancillary equipment and supplies that are appropriate to objectives and site conditions. Support equipment that is required for the use of the primary equipment. Equipment for suppling power is a prime example. Geotech offers Honda portable generators for their performance and reliability. Geotech offers two kinds of portable air compressors, electric powered and gas powered. Both were selected for dependability, low maintenance and oil-free high performance. They are ideal for sites using pneumatic pumps and skimmers for hydrocarbon recovery from groundwater. Make finding buried metal objects easier with the most sensitive and ruggedly-built ferromagnetic locators available. Locate steel well heads, survey pins, iron pipes, manhole covers, and other ferrous objects hidden under pavement, grass, or snow. 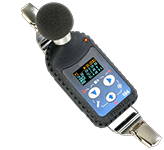 Svantek 104 Series personal noise meters offer a new approach to occupational health and safety dBA monitoring. The 104 Series feature a color OLED screen display for excellent visibility in low or bright light conditions, tamper-proof lightweight design, and up to a 50 hour operational time. The internal dynamic range microphone measures from 55 dBA to 141 dBA. Consumable supplies that are used in support of sampling and measurement activities. Materials such as calibration standards, sample containers or disposable sampling equipment that potentially affects the outcome of environmental measurements. Reference materials whose properties have been established so that it can provide a level of performance verification. For field measurements, examples are pH buffers, specific conductivity standards, chemical reagents, turbidity standards and oxidation reduction potential standards. Field instrumentation require supplies for the actual collection process as well as quality control activities and crucial operational maintenance. Geotech strives to keep our customers safe with the safety gear they need. From gloves and Tyvek® suits, to safety glasses and hard hats. Equipment designed for environmental well operations in accordance with local and federal procedures. Record keeping is the responsibility of all field personnel. Records must be established and maintained for each uniquely identified sampling location to permanently document field activities, measurement readings, instrument calibration, and any other information needed to meet programmatic or regulatory requirements. “Rite in the Rain” is a paper created specifically for writing field notes outdoors in all weather conditions. Geotech has a full range of high quality tubing in different sizes and materials available in stock for your environmental sampling and remediation needs. Tubing is priced per foot or by the roll. Geotech offers four kinds of bailing cord made from nylon and coated stainless steel.